in the Durban Harbour, Kwa-Zulu Natal, South Africa. Even though Dave’s leaving was delayed, we knew it wasn’t really a reprieve, as he’ll be on the oil rig project for about two months… from when he starts. 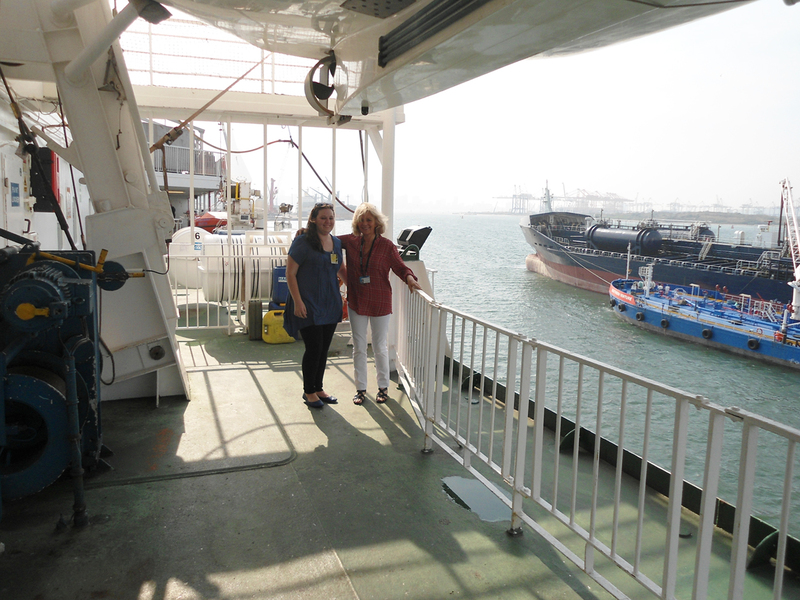 His unexpected delay, did allow for him to arrange a special surprise for me and Jess… A visit to the Africa Mercy which is currently docked in the Durban harbour for annual maintenance and repairs. 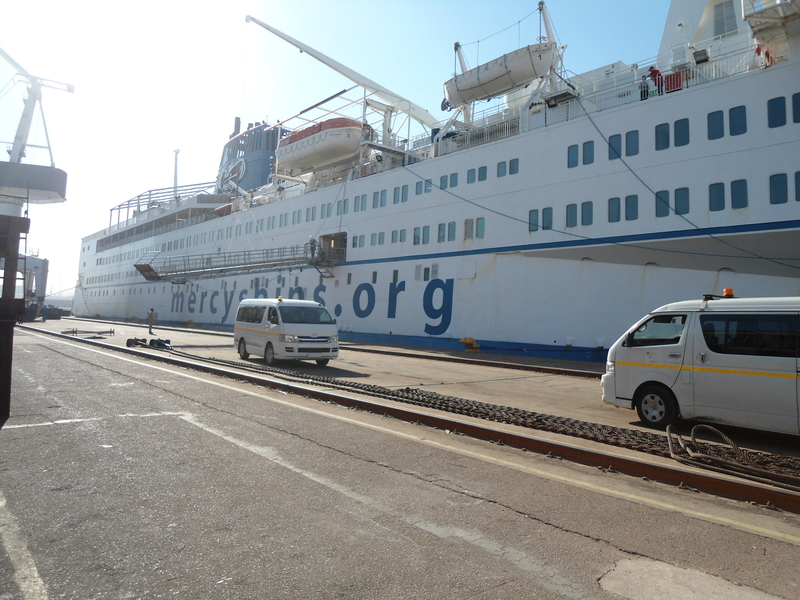 The Africa Mercy is a medical ship providing medical treatment and surgery to the poorest people in Africa for free. 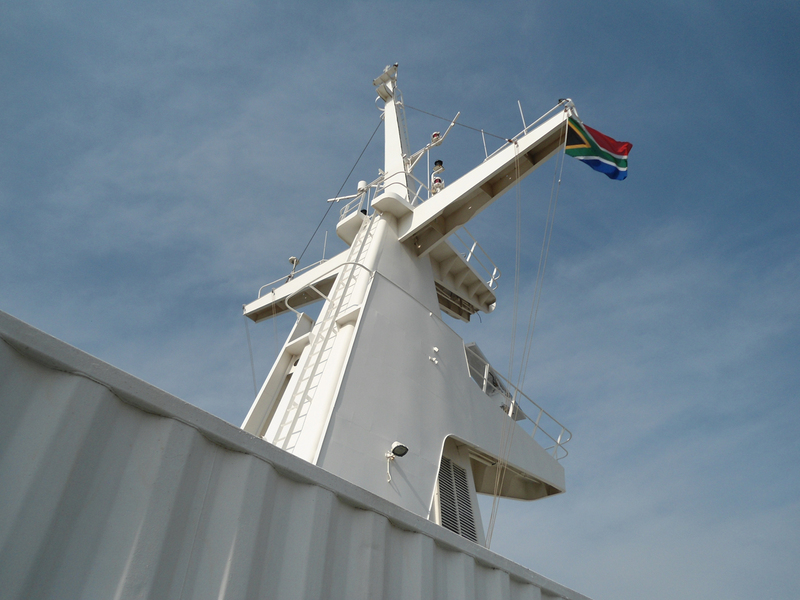 The ship has been docked on the coast of Madagascar providing care and assistance to the needy, and will return there, after her maintenance is completed in early August to continue this amazing work. Dr Venter, a South African plastic surgeon gave up his practice in Port Elizabeth 10 years ago, to volunteer his services full time… he is currently in the U.S. on a “Cycle Miles for Smiles” campaign to create awareness and raise funds for his next 10 months (and longer), of volunteer work on the Africa Mercy. Even though I didn’t get to meet any medical volunteers as they return home for a few weeks while the ship undergoes her annual maintenance… the ship was still full of volunteers that come at this time to provide other special skills and services… and repairs and maintenance work was in full swing. 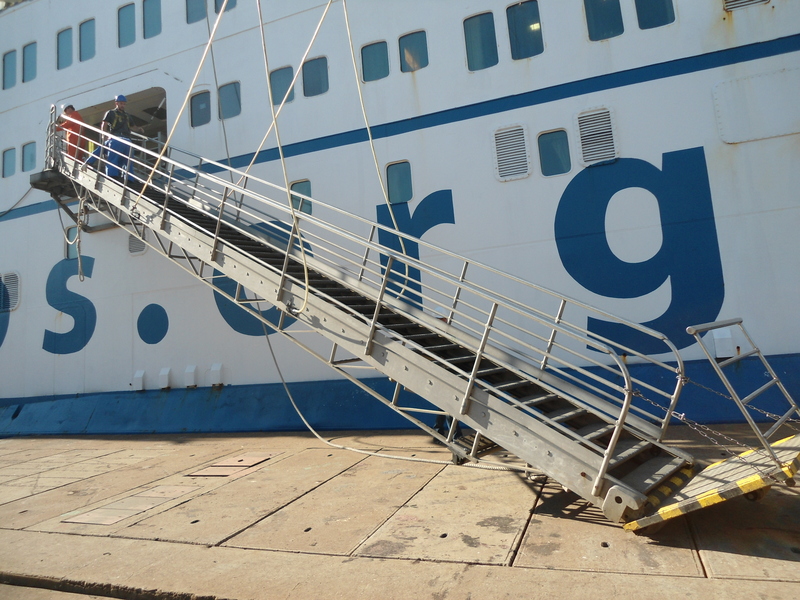 Can you imagine electricians, welders, plumbers and painters who not only work for free… but pay for their travel to and from the ship, and for their accommodation and other expenses while they are on board working? The energy on board the Africa Mercy is amazing… and I could feel the love and compassion as I envisioned the operating rooms busy with surgeries and procedures, the hospital wards filled with patients and medical staff, and the Hope centre filled with desperate people… seeking and finding hope. From the moment a patient steps on board the Africa Mercy every need is met, with love, compassion and the best medical care available. Robin is like the Mayor, although he was a bit taken aback when I suggested it, *Smile* and Laurette is the perfect mother away from home… as she welcomed us warmly and made us feel so at home I wanted to stay. These are humble unassuming people serving God in the most exemplary way, bringing hope to the poorest people in the world, and providing the very best professional care with love and compassion through their own personal sacrifice. I left wanting to stay… and definitely wanting to return, and a little envious of the newest volunteers arriving …a 20 something young man from Johannesburg signed on as a dinning assistant, quietly charming with a twinkle in his eye to match his enthusiasm for his new adventure, alongside his gregarious blue eyed colleague from Iowa, in the USA. Whilst the cabins are comfortable, they are small and functioning, and I’m sure the brand new library which is absolutely stunning will be well frequented. As I chatted to Laurette about her life and her service, she also told me about her time aboard the Anastasis as a nurse many, many years ago, the long hours, sore feet and memorable experiences, and her love for God and excitement to serve now at this time are inspiring… I was truly grateful for this wonderful experience and to have met her, and I felt very humbled to give her a small Wow notebook to acknowledge her as a true Woman of Worth. These are special people doing ordinary things in an extraordinary way… touching hearts, inspiring change and making a difference. Please support the Africa Mercy anyway you can. As a volunteer, with time and service. With much needed donations, and mostly especially with your prayers. The Africa Mercy always flies the flag of the country she is harboured in. The MV Africa Mercy is a 152.00 m (498 ft 8 in), 16,572 GT Hospital Ship belonging to the humanitarian organization Mercy Ships. Converted from a Rail Ferry in 2007, it is currently the world’s largest non-governmental floating hospital. 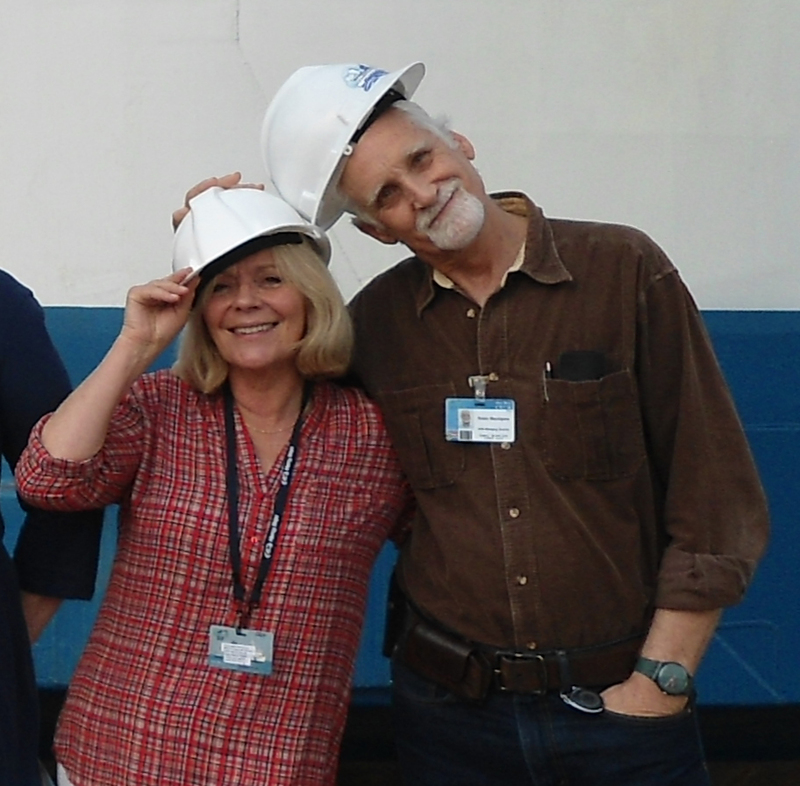 It is the newest ship to enter service with Mercy Ships, which has been outfitting and operating hospital ships that serve developing nations since 1978.